Today was a wonderful day! 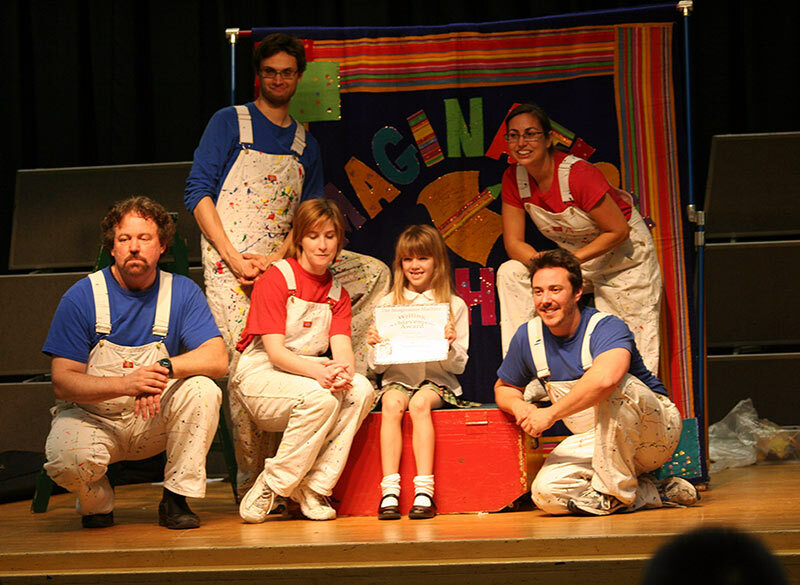 Amara, our little author, wrote a story so amazing that it was turned into a play. Amara has won awards for her writing before, but this was something very special. Her story was going to be a play. She was only a little disappointed that she couldn’t be in it. The story of Harold the Tickling Dragon. 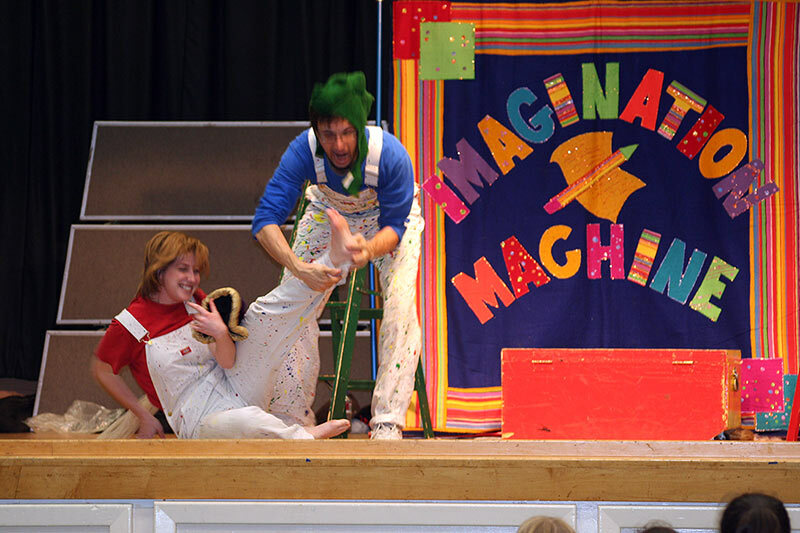 One of the great things that the PTA at Amara’s school does, is to have the Imagination Machine come to the school to perform. It is a small and very funny acting troupe of four and they relate wonderfully with the kids. They ask all of the students to write a story and submit it to their teacher. The teachers select what they think are the best and from those the acting troupe picks 4 or 5 to turn into plays for the kids. Amara’s story got picked! Harold the Tickling Dragon is the story of Princess Lily who is kidnapped by Harold and tickled! And the kids just loved it! Every time you thought he was done tickling her, he wasn’t! It was so fun to see the kids so engaged in the story. I found it very interesting that the story was about Princess Lilly. She has been very big in Amara bedtime stories lately, she always wants you to include a Princess Lilly. AND the story was about being tickled — which is one of Amara’s favorite past times. Whenever she comes over or we go over there, she always asks to be tickled. I am always amazed when we go to one of the events at the school. It is so much fun to watch all these kids file in and behave so well. These are not the kids from Kindergarten Cop. Amara was so excited she could hardly sit still and it was making her Mom a bit crazy but who could blame her, they were going to perform her story! We were so proud. 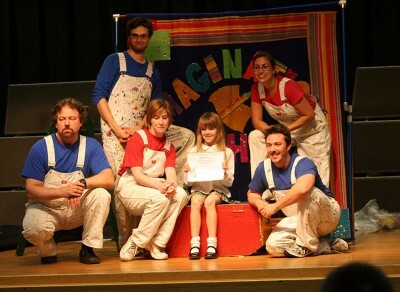 After it was over each of the authors received a special certificate and got to sit on stage with the Imagination Movers so they could have their pictures taken. Guess who was the first one to run up on stage? This is another day I will never forget. This memory was posted in Special Occasions and tagged acting, Amara, author, award, Imagination Machine, play, Princess, school, story time, tickle on February 25, 2011 by Grandma Kc. Oh my gosh! How exciting for all of you! Way to go Amara! Kc, I’m so glad you got to be there and share in the fun!! What wonderful memories! What a wonderful way to engage young writers. Congratulations to all of you for having such a creative artist in your midst. What a wonderful story to share with my grandkids! You should brag!! That is truly amazing! She is obviously very, very talented and very intelligent. You have a right to be very proud of her. What a wonderful story. Thank you for sharing this. Did you send this to Autumn? I am all for encouraging the arts in the schools and this program sounds wonderful. Amara is obviously a very intelligent and talented young lady, and should be allowed to follow her taalent wherever it leads her! Congrat’s to the little author. That is so awesome! Way to go, Amara! Yay Amara – I’m only a little jealous that it wasn’t about a tickling Grampy. Such an honor for the young writer. I hope Amara continues to express herself through her words, as they’re clearly magical to all who hear them (and perform them). You already know this, but Amara is an incredibly special young lady. I’m honored to know her through you. Thank you for linking to the GRAND Social and for being so active with the linky. You are so awesome in getting around to the other blogs and commenting. I wish I could nudge more back here to do the same, for you deserve it (and more! ).